History: The life of Sean Cassidy is tied strongly to his name. The Cassidy family is historically one of the most well-regarded names in Ireland. With long ties to Irish nobility, Sean Cassidy was born into a life of relative wealth and comfort at the Cassidy family estate, known locally as Cassidy Keep. He is the youngest of Liam and Eamon Cassidy’s two sons. Both he and his brother, Tom, were groomed to take over the family assets at a young age. As a child, Sean learned the extent of the Cassidy family legacy. Their history has been traced as far back as the 12th century where the Cassidy family made a name for themselves by fighting off Viking invaders from the Irish countryside. They started off as warriors, but became so effective that they eventually became part of the Irish nobility. Both Sean and Tom were told stories as children about how the Cassidy family had participated in various wars and worked to secure the honor of both their homeland and their name. Both brothers took that story to heart as they began training to protect that honor for another generation. Like many wealthy children, Sean attended private school and was given many opportunities growing up. While he excelled in the classroom, Tom did better with sports and socializing. As a result, Sean remained in his brother’s shadow for most of his early years. As a result, they rarely got along. It sewed the seeds of a rivalry that would play out in many different ways over the years. Sometimes it was sports. Sometimes it was friends. Sometimes it was women. Whatever the challenge, both boys competed to be the better Cassidy. As their rivalry evolved, The Cassidy family underwent a transition period. While the Cassidy family had been patronized by the British aristocracy for most of its history, Sean’s father shifted the family resources into partnerships with European defense contractors. In the tradition of the Cassidy family, he sought to protect his homeland. It ensured the continuous growth of family wealth, but it also set the stage for further escalation in Sean’s rivalry with his brother. While Sean was just beginning his studies at Sussex University, Tom began working closely with his father on the family business. He believed that the business for weapons was too weak and endorsed selling them on a larger scale. His father opposed this and so did Sean because it meant some of their weapons may fall into the hands of criminals and warlords. It led Sean to drop out of his studies at university early because he feared his brother would undermine the family. He ended up being vindicated in a terrible way. Unknown to Sean or the rest of the family, Tom discovered that he was a mutant while still attending private school. He had been playing a game of cricket with some friends of his when a rival school challenged them to a match. Being a fierce competitor, Tom accepted and during the match his mutant abilities to channel energy through specific materials manifested. In an uncontrolled blast that erupted from his cricket bat, he ended up injuring most of the rival team. He kept this incident a secret from his family, but he continued to use his powers to instill fear and respect. He later found out that mutant powers were a large part of why the Cassidy family had been so effective as warriors for so long. He eventually sought to use this in another way that was equally destructive. Armed with his mutant powers, Tom staged an attack by the Irish Republican Army during a meeting of prominent European politicians in Dublin. The attack prompted increased demand of the Cassidy family business operations, but Sean found out about this and exposed his ploy to his parents. Infuriated, Liam Cassidy barred Tom from participating in the family business. Tom responded in anger and attacked Sean for exposing him. During the fight, however, Liam came to his son’s aid and was seriously wounded. Their mother also tried to stop him, but she ended up being hurt as well. In a fit of outrage, Sean cursed his brother by yelling at him and in doing so triggered the manifestation of his mutant powers. With these powers he was able to subdue his brother, but the damage had been done. In wake of Tom’s outburst, Liam Cassidy died from his injuries and his mother was confined to a wheelchair for the rest of her life. She cursed Tom for putting a black stain on the family, which later became the inspiration for his infamous title, Black Tom. But despite being cut off from his family resources, Tom struck out on his own to continue dealing weapons. It left Sean to seek another path to counter his brother. So while still a teenager, he joined the British army. Unlike his many other endeavors as a Cassidy, his family name earned him no special treatment. Sean endured the same rugged treatment as any British serviceman and he would have to earn his prestige. Since his brother had done so much to undermine the Cassidy name, Sean took it upon himself to excel. His drive and educated background helped him rise through the ranks of the British army. He eventually gained a role in the British Special Forces where he participated in operations to take down his brother, who had also risen through the ranks of major arms dealers. He was poised to build a solid career in the military when his mutant status caught up with him. Despite years of loyal service in the British Special Forces, the United Kingdom signed an international treaty that barred mutants from serving in the armed forces. As a result, Sean eventually resigned from his post. Still determined to fight his brother and honor the family name, he took a job with an up and coming private military company known as White Cell. This company specialized in hiring mutants for military services. Due to his background, Sean Cassidy quickly found a place in the emerging company. It was here he gained his nickname, Banshee. It is also here where he learned to utilize his sonic powers for flight. His activities from this point forward are largely obscured, mostly due to the secretive nature of White Cell. However, it does appear that he remained active in opposing his brother’s operations, which also became somewhat obscured during this period as well. In his time at White Cell, he became a mentor for other mutants and former soldiers. This attracted the attention of Charles Xavier, who had been working to establish his Xavier Institute for Higher Learning at the time. At first, Sean rebuked Xavier’s offer. Then another bitter dispute with his brother changed his mind. While still at White Cell, Sean learned that his brother was funneling illegal weapons through dummy corporations under the Cassidy family name. He tracked one of these corporations to an operation in Scotland where his brother was supposedly conducting business with a human trafficking ring. During this operation, Sean confronted his brother and the victims of his devious business practices. Among the victims was a young Scottish girl named Rahne Sinclair. Her parents, horrified by her mutation, sold her to a trafficking ring and was being conditioned by Black Tom and his young daughter, Theresa, to be an attack dog of sorts. Horrified, Sean led an attack against his brother. While he wasn’t able to take his brother down, he was able to save Rahne. Given her youth and vulnerability, he decided to help her. Sean legally adopted Rahne as his daughter and took her to the Xavier Institute where she recovered from her ordeal and eventually came to embrace the X-men. 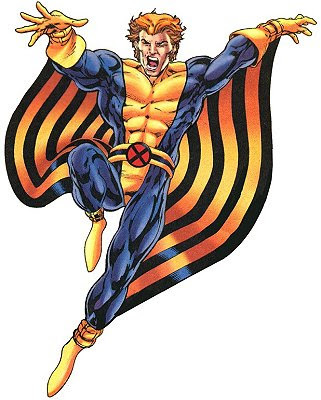 This led Sean to taking on a larger role at the institute, eventually reducing his participation in White Cell to a part time gig so he could teach the X-men alongside John Proudstar. He even went on missions with them occasionally. However, he was reluctant to expose his family name publicly as an X-man and maintained an administrative role for the most part. This role led Sean to cross paths with Moria MacTaggart, a former lover of Charles Xavier and a prominent mutant researcher. She assisted Rahne in perfecting her shifting powers and in the process, Sean became smitten with her. When Moira sought another way of helping mutants, Sean chose to follow her. He used his family resources to help her establish Muir Island, a highly advanced research facility dedicated to researching mutation. He also took an active role in helping her run it. For a while, Rahne remained with the X-men. But when Moira’s son from her ex-husband, Kevin, started to struggle with his powers, Rahne chose to follow her adopted father to Ireland. This happened shortly before the X-men unmasked and ensured the Cassidy name wasn’t exposed in the process. As his relationship with Moira became serious, Sean parted ways with the X-men. He maintained a relationship with White Cell though, using his position to help John Proudstar land a job with them after he left the X-men as well. He eventually came to embrace Moira’s mission to help mutants. He remains Muir Island’s chief administrator and surrogate father to both Rahne and Moira’s son, Kevin. The events of the Proteus incident, however, left deep emotional wounds for them and the future for their family remains unclear. Character Breakdown: Like many individuals born into a family with a prestigious name, Sean’s personality is largely shaped by his family affairs. Being in such a family created a sense of entitlement that became the main driving force for the rivalry between him and Black Tom. The greatest threat to that entitlement was each other so there was really never much incentive for them to develop a close sibling bond. It forced Sean to adopt a very driven and competitive mentality. Like his brother, much of his personality is built around a desire to live up his family name. Unlike his brother, that drive is tapered by a sense of humility that was forged during his time with British Special Forces. Sean’s career in the military and White Cell created a different environment for his personality to develop. Unlike his home at Cassidy Keep, his family name did not gain him any extra privilege. He was forced to earn his rank and his prestige. Rather than resort to intimidation like his brother did, he decided to take the opposite path and persevere. This forged a strong sense of honor in Sean that helped make him a great soldier and a respected X-men. Whenever that honored was threatened, especially when he was expelled from British Special Forces due to his mutant powers, that sense of honor encouraged him to push harder. This helped drive him to become a leading figure in White Cell and later with the X-men. He places a high value on the honor of his family name and bears a strong sense of responsibility for maintaining that honor. His innate drive coupled with the humility instilled upon him by his military background provides Sean with a disciplined moral framework. Being a mutant and having special abilities doesn’t lead him to believe he’s better than others. It leads him to believe that he has a greater responsibility to honor his family name. This also further widened the divide between him and Black Tom, whose greed and misguided drive served to severely undermine the honor of the Cassidy family. In many ways this rivalry served as a reinforcing factor in the different paths they took. Since both he and his brother are innately competitive and driven, they are both exceptionally dedicated to their respective pursuits.